Is the role of partners fading away with the PC? Microsoft CEO Steve Ballmer is optimistic about Windows 8, the Surface tablet and, yes, even future Microsoft-branded hardware. "If we see an opportunity in the software/hardware seam, we're going to take it," Ballmer said to an audience including TechCrunch while speaking at the Churchill Club in Santa Clara. This is in line with the CEO's previous statements in which he said that Microsoft was "obviously" going to make more of its own hardware. Microsoft Surface 2, smartphone in the works? There has been growing speculation that the company is working on a Microsoft Surface 2 tablet or an Xbox Surface tablet, and testing a Windows-branded smartphone. While Ballmer alluded to future Microsoft devices at the event, he didn't see his company controlling the smartphone hardware entirely. Instead, he felt as if reliable partners would make more sense and the Windows Phone platform would benefit from more innovation as a result. Microsoft's desire to have some control over hardware and software is akin to Apple's business strategy, but the CEO recently called its rival a low-volume player in everything but tablets. 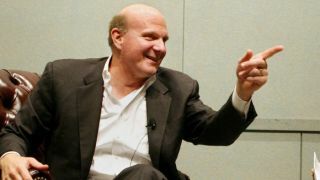 A bit like Goldilocks, Ballmer wants Microsoft to fit right in the middle, acting as a wedge between Google's Android and Apple's iOS platforms. "The ecosystem of Android is a little bit wild," Ballmer told the crowd, further saying that this "maybe not in a way that's always in the consumer's best interest." "Conversely, the Apple ecosystem looks highly controlled, and by the way, quite high-priced." Ballmer called Microsoft's strategy "the best of both worlds." This is a reference he used in connection with the Surface tablet and Windows 8 at the same event, describing how Microsoft's current products also straddle the line between "work and play." A massive survey found that people have little desire to upgrade to the Windows 8 operating system, so maybe a little more work than play still is in order at Microsoft.